In this article, we’re going to look at how you can automatically add your affiliates to your autoresponder when they sign up to promote your products. This is a great way to manage your affiliates, offer onboarding and automatic follow-up assistance to help them in their marketing efforts. You also have a list you can directly email in the future about other products they may be interested in promoting. As with everything in ThriveCart, it takes just a few clicks using our powerful behaviour rule system. 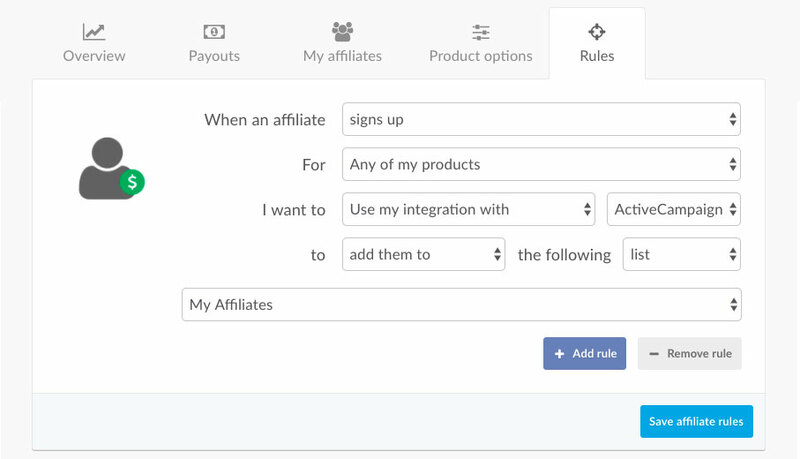 The first step is to navigate to the affiliate rules area by clicking the affiliates menu icon in your dashboard, then clicking the rules tab. Here you will be shown any existing rules you’ve created for your affiliates. 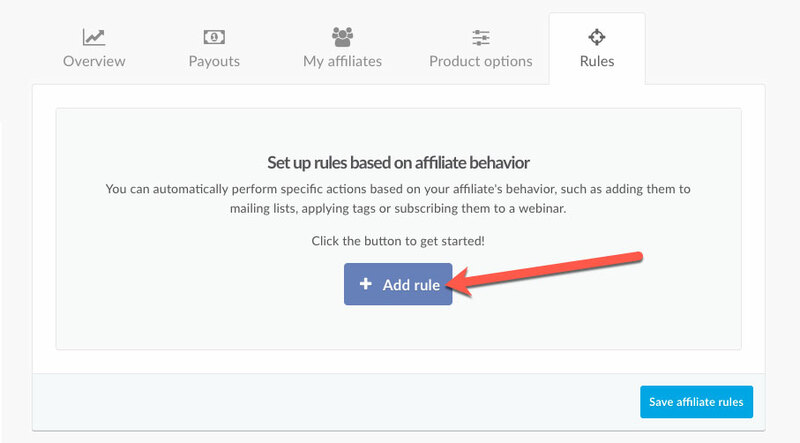 If you’ve not already created any rules you’ll need to click the Add rule button to get started. You’ll then be presented with the base template, which you can go ahead and complete. The first decision you’ll want to make is what triggers the rule. You’ll have various rules around the affiliate signing up or being rejected/revoked and we also have various rules about their performance. In this case, you’ll want to create a rule for when someone signs up to be an affiliate. Next, we can look at creating rules specifically to trigger on certain products or to trigger when they sign up for any product. The decision here is yours. In this example, we’re going to select the option “any of my products”. This way when an affiliate signs up for any product in your account this behaviour rule will action. Next, we want to choose what action we want to take. When selecting the first drop down you’ll have many different options such as using an integrated service, sending an email, triggering Webhook notifications, adding/removing to other products and changing when they are paid commissions. There’s a lot of depth and some really great stuff you can set in automation here. In our example we’re adding our affiliate to our autoresponder, so we’ll choose “Use my integration with” and then from the next drop down select our autoresponder. Now that’s done, we can leave the option ‘add them to” selected and choose what we want to add them to. With ActiveCampaign you have the option of a list, automation, existing tag, or a new tag. These options will update depending on the autoresponder you use and their supported features. In this example, we’re going to use a list. Then finally we need to select that list, or depending on what you choose to use, the tag, automation, sequence, etc. This completes your behaviour rule set up. The last thing we need to do is click that Save affiliate rules button. So now, whenever someone signs up to promote a product you have for sale, their contact details will be added to the list or tag with your chosen autoresponder. If you have any questions regarding this, feel free to contact the team directly.